What do Arnold Schwarzenegger, Steven Tyler, Stevie Nicks, Billy Crystal, and my father all have in common? At least two things. They will, God willing, all celebrate their 70 1/2 birthdays in 2018 and join the ranks of approximately 25 million others in the United States over this age (assuming, of course, that they all still celebrate half-birthdays). The second commonality is that, as far as I know, none of them pay attention to any of my personal finance advice. There is the possibility that Billy or Steven read the blog but my father definitely ignores all the financial advice, investment advice, tax advice, and general retirement advice from his son who makes a profession providing such advice to others. I believe this is is referred to as payback. Assuming both these commonalities are true, it implies that none of Arnold, Steven, Stevie, Billy, or my father read this 2017 Astute Angle post about qualified charitable distributions. And that may have been reasonable. The topic of the article – qualified charitable distributions (QCD) – was targeted at a narrow group of individuals over age 70 1/2. Back in 2017, they were all busy enjoying their year of peak lifetime happiness and did not need to be bothered with such trivial tax minimization strategies. Two important things change or changed in 2018. Celebrate or not, all five will reach the important age of 70.5 at which point they become eligible for the qualified charitable distribution. The second big change transpired on January 1st when the Tax Cuts and Jobs Act became law. This new law initiated many consequential changes including the dramatic expansion of individuals who directly benefit from utilizing the QCD. The qualified charitable distribution instantly transformed into a tax-saving opportunity for most of the 25 million Americans over age 70.5 (click here for an explanation of how the QCD works and what it is). Why the change? The biggest factor in the QCD’s newly increased reach was the expansion of the standard deduction on January 1st by 75% for married couples over age 70.5 (technically, for filers age 65 and over) from $15,200 in 2017 to 26,600 in 2018. Moreover, for single filers over age 70.5, the standard deduction increased from $7,900 to $13,600. These changes plus the new limits on property and state tax deductions mean that most retirees will use the standard deduction and, resultantly, get no tax benefit from charitable contributions. Example 1: Consider the case of a 71 year-old married couple, Jack and Diane, who have taxable Social Security income, dividends, and interest of $90,000 plus another $35,000 of required minimum IRA distributions from Jack’s IRA for total adjusted gross income of $125,000. They pay $5,000 of state taxes and $7,000 of property taxes, and have no mortgage or major medical expenses. This year, they moved $35,000 from Jack’s IRA to their joint bank account to fulfill the required minimum distribution. Later in the year, they will write a check from their bank account for $15,000 to their favorite charity. Based on all their income and deductions, they will owe $11,607 in federal taxes. Example 2: Now, assume everything stays the same except for the way in which Jack and Diane make their $15,000 charitable gift. Instead of moving $35,000 from Jack’s IRA to their bank account, they move $20,000 from the IRA to their joint bank account. Additionally, they give the same charity the same $15,000 but these funds come directly from the IRA. That is, the charity gets the $15,000 check directly from Jack’s IRA instead of going from Jack’s IRA to the bank account and then to the charity. Financially, nothing changes for Jack and Diane and nothing changes for the charity. Check that – one thing changes for Jack and Diane. Instead of paying $11,607 in taxes in our initial example, they pay $7,557 in the second case. Their tax liability drops by $4,050 or 34.9% simply because they were wise enough to make use of the qualified charitable distribution. What caused this significant reduction in federal taxes? In example 1, Jack and Diane made $15,000 of charitable contributions but they did not get any benefit from these contributions because their total itemized deductions of $25,000 were less than their standard deduction of $26,600. Had they given away $5,000, $10,000, or $15,000 or zero to charity, they would have faced the exact same federal tax liability. 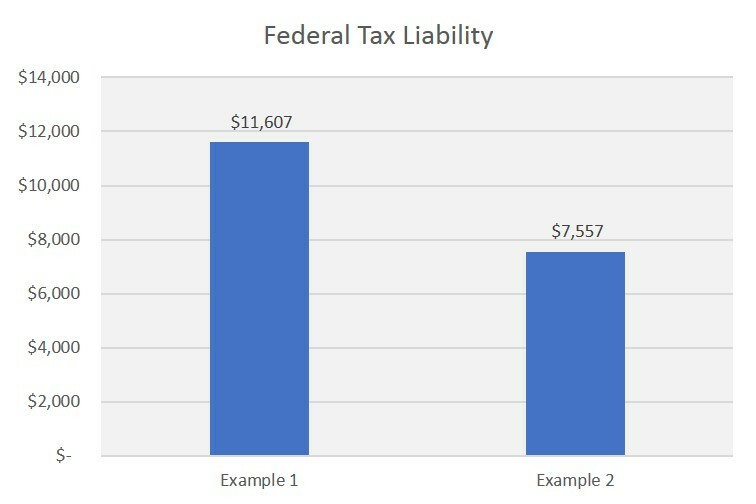 In the second example, because they made the gift directly from their IRA and utilized the qualified charitable distribution, what would have been a taxable $35,000 mandatory IRA distribution was reduced to a $20,000 taxable distribution. 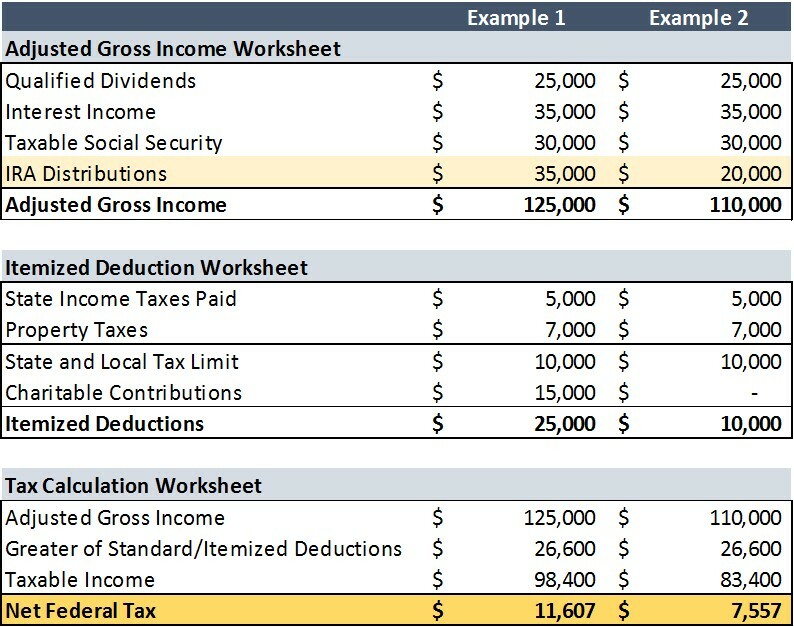 In turn, their adjusted gross income and taxable income in example 2 were both $15,000 lower than in example 1. Yes, their itemized deductions were also $15,000 lower because they didn’t get to claim any charitable contributions but that’s the whole point. Reducing their income by $15,000 was far more valuable than increasing their itemized deductions by $15,000. This is going to be the new reality for a lot of people over 70.5. A married couple without major medical expenses or without a primary mortgage interest expense that exceeds $16,600 per year are likely to benefit from utilizing the qualified charitable distribution for the same reasons as Jack and Diane. It is a tax savings tool, unavailable to anyone under age 70.5, that effectively allows for the shifting of charitable deductions from the Schedule A, where they may not be entirely useful, to the front page of the Form 1040, where they’re going to be useful for anyone who pays taxes. Taxpayers over age 70 1/2 have a unique tax saving opportunity that deserves more attention than it has received. The QCD opportunity was somewhat limited before 2018 but materially expanded with the Tax Cuts and Jobs Act of 2017 so that most individuals above age 70.5 who have the desire to give money to charity would now be well-served to use the qualified charitable distribution. Maybe you are not yet at an age where you can utilize the QCD opportunity but you may have parents or grandparents for whom this might be particularly useful. And perhaps they will be more apt to pay attention to this tax saving advice than mine.